Current tools to define analytics are not accessible without deep IT involvement – and worse – IT is often not available for these projects. Business and operations analysts do not have the IT, data science, or other technical skills to model the analytics needed for IoT use cases. Big Data tools often require highly specialized skills and expertise in new languages. Moreover – these skills are in short supply. Operationalizing predictive models at the scale and speed required for IoT is very difficult. Today’s tools do not support the rapid cycle of model refinement that is crucial for IoT. Self-service tools for business professionals that do not require technical skills or knowledge – this democratizes the process, stimulates innovation, and removes the dependency on scarce IT resources. Business and application experts are now able to leverage their domain expertise easily to help define and create IoT Analytics solutions. Visual Modeling Tools that simplify and accelerate the process of creating solutions with little or no coding. VIA’s Visual Flow Designer empowers developers to quickly create analytics processing flows visually – enabling the development of IoT solutions in days not months. Specialized Big Data development skills are no longer a major issue. Continuous refinement of machine learned models through a rapid iteration process of discovery, model building, operationalizing, and monitoring enables rapid deployment of models. 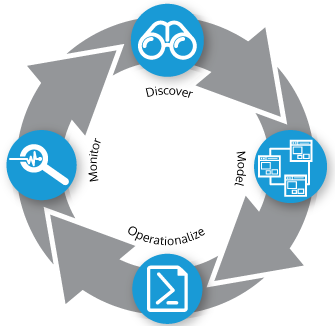 This iteration cycle leverages valuable real-world experience to improve accuracy and accelerate better business outcomes. IoT Analytics offers the promise of many innovative new solutions to address operational and business issues that were not solvable in previous eras. However, doing so requires a new level of platform that addresses the challenging issues associated with creation of solutions at IoT scale. VIA is the only platform that combines all of the capabilities required to enable your team to innovate rapidly with IoT Analytics.